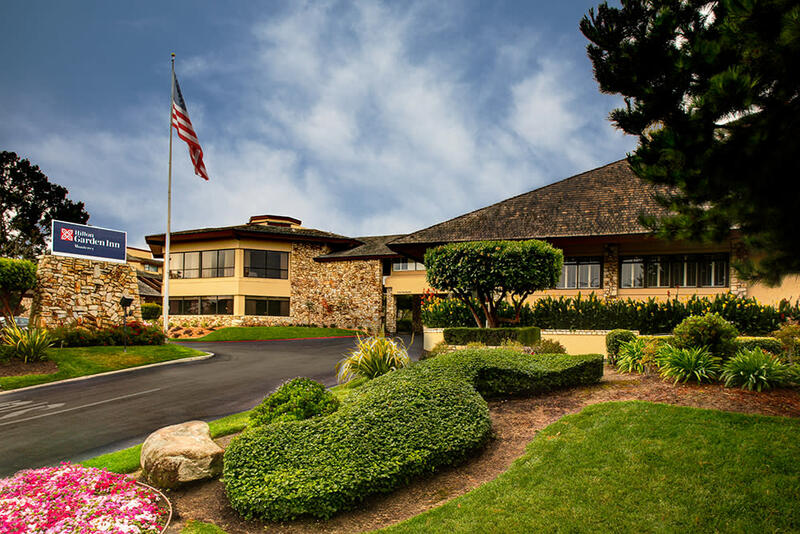 The Hilton Garden Inn Monterey is nestled among Monterey pines and mature live oaks, the hotel is in a dramatic and beautiful setting. It is only three miles from Monterey Peninsula Airport (MRY), is in close proximity to California's scenic Highway 1, and less than one-half mile from the world-famous beaches of Monterey Bay. The Hilton Garden Inn Monterey offers 204 spacious guest rooms and 6,500 square feet of meeting space. Each contemporary room includes a crisp, clean design with a large work desk, a 42-inch flat-screen TV and complimentary high speed Internet access. Guests are invited to start each day with a cooked-to-order breakfast and enjoy fine cuisine every night in the hotel’s Pacific Grille restaurant, which offers contemporary California dishes. For recreation, the Hilton Garden Inn Monterey offers an outdoor heated swimming pool, whirlpool, fitness center and onsite bike rentals. Additional amenities include a Business Center, 24-hour Pavilion Pantry® and onsite parking for a fee. Meeting planners will enjoy the professional services and easy-to-book meeting packages, while those planning a social event or wedding will enjoy the unique setting.